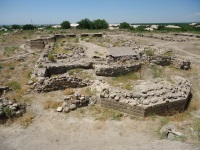 The archaeological site of the city of Dvin is part of the Tentative list of Armenia in order to qualify for inclusion in the World Heritage List. Just returned from Armenia (July 2014), I doubt if alone it once will be inscribed. There is not much left from original city, just single stones of foundations, rest of columns, part of walls (layer of 3 to 4 stones maximum). It is still a excavation site so maybe they will discover something more spectacular in the future ? So far the most visible ruins are those of huge basilica, but it is nothing comparing to other well preserved churches in Armenia.